This setup opens up avenues of exploration within CAM’s ceramics collection, but with the creation of the Cranbrook Center for Collections and Research it also allows objects from across campus—and across centuries—to interact with each other under the roof of the Collections Wing. The Center for Collections and Research is charged with preserving and interpreting the history of all 100+ years and 320 acres of Cranbrook’s campus. While most of the time that means working with historic art and artifacts in situ, on occasion we move especially vulnerable, valuable, or delicate objects into the Collection Wing for storage and protection. And with their presence in the vault, Center and CAM staff members have the chance to bring artwork from different countries, time periods, and areas of campus together and see what happens. Most recently, that interaction has resulted in the current “curated moment” on view in the ceramics vault. Featuring the work of three incredibly influential ceramicists of the twentieth century, these works stand in dialogue with each other even as they represent different approaches to clay and its properties. 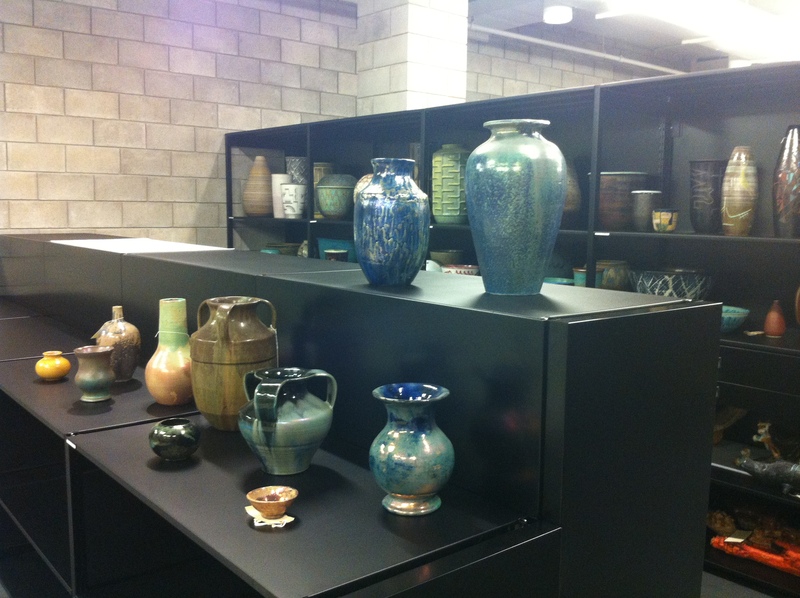 Pewabic Pottery vases and bowls on view in the ceramics vault. Behind the Pewabic pieces are ceramic works by Maija Grotell. Shoshana Resnikoff/Cranbrook Art Museum, 2013. When visitors tour the Collections Wing, their experience of the ceramics vault begins with Mary Chase Perry Stratton. Her work, and the work of the Arts and Crafts pottery studio that she founded in Detroit in the first decade of the twentieth century, occupies the temporary “curated” shelving at the very front of the vault. Stratton founded Pewabic Pottery in 1903 with her partner Horace Caulkins. Pewabic quickly grew, producing vessels, tiles, and ceramic architectural features for national commissions. Museums, universities, and public buildings across the country feature Pewabic tile-work, and in the metro Detroit area alone there are countless installations (including the tile in the American galleries at the Detroit Institute of Art, where newly re-installed American silver glitters in front of iridescent Pewabic tiles). Mary Chase Perry Stratton lays out Pewabic tile pieces for the Rainbow Fountain installation at Cranbrook, 1916. Cranbrook Archives. A founding member of the Detroit Society of Arts and Crafts, Mary Chase Perry Stratton was a close friend to George and Ellen Booth. Pewabic tiles show up all over Cranbrook’s campus, and a portion of the vessels on display in the ceramics vault come from other campus areas rather than Cranbrook Art Museum’s collections. In the Pewabic objects, visitors can begin to get a sense of the scope of ceramics at Cranbrook and the role of the Center for Collections and Research in bringing all these objects together. 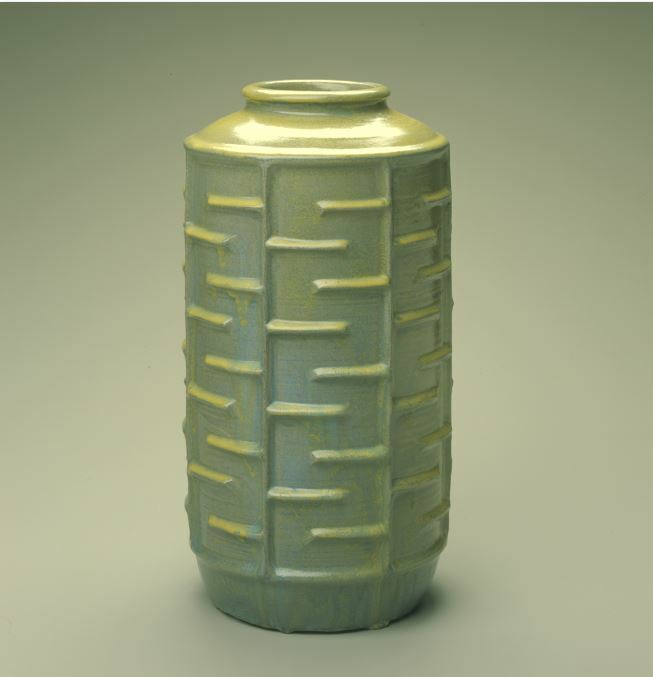 Pewabic Pottery, Two-Handled Vase, 1929. Cranbrook Educational Community. 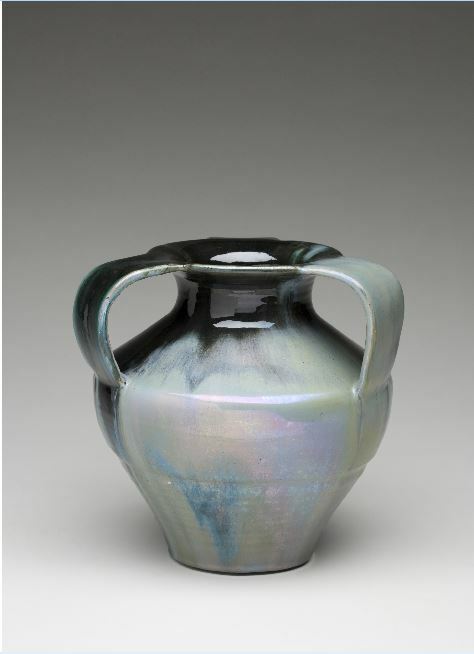 What makes Mary Chase Perry Stratton and her Pewabic ceramics so significant is not necessarily the form her ceramics take, which are intentionally traditional, but the phenomenal glazes with which she worked. The objects on display in the vault are conventional forms, from the amphora (a two-handled vase) to classic vases and bowls. They are all functional vessels that are meant for regular use, but their iridescent glazes and shifting coloration mark them as art objects as well. Their shimmering, changeable surfaces shine under the light, defying color categorization and giving unexpected depth and movement to entirely expected shapes. Maija Grotell, Vase, circa 1942. Cranbrook Art Museum. Vessels made by Maija Grotell line the shelf behind the Pewabic ceramics, providing a bold counterpoint to Stratton’s elegant forms. Grotell, a Finnish ceramicist who came to Cranbrook in 1938, helped to put Cranbrook Academy of Art on the map. One of the great figures of 20th century ceramics, Grotell taught generations of Academy students until her retirement from Cranbrook in 1966. Her works rise above the Pewabic pottery, their size and heft illustrating her efforts to make ceramics bigger and more monumental. Grotell takes the traditional forms that Pewabic Pottery works in and expands them, pushing the boundaries of how we expect a vase or bowl to function. Too large to carry with ease, some of Grotell’s vases seem more like architectural features than functional vessels for flower arrangements or carrying liquid. Despite their size and stature, however, her ceramics are still unmistakably utilitarian. Maija Grotell with pot, 1941. Cranbrook Archives. While the size and shape of Grotell’s work provide visual drama, it is the surface of the vessels that truly sing. Here is where the conversation with the Pewabic pottery turns from contrast to comparison. Like Stratton, Grotell was fascinated by glaze. Known for experimenting with glaze chemistry and technology, Grotell was interested in the ways that a glaze and decoration could draw a viewer into a clay body, interacting with the surface of the vessel and providing engaging moments for both the eye and the hand. Grotell’s experimentation with glazes went beyond the utilitarian wares she threw on her wheel—when working on his landmark General Motors Technical Center in Warren, MI, architect Eero Saarinen turned to Maija Grotell in order to get the exact right look for the glaze on the building’s exterior ceramic walls. 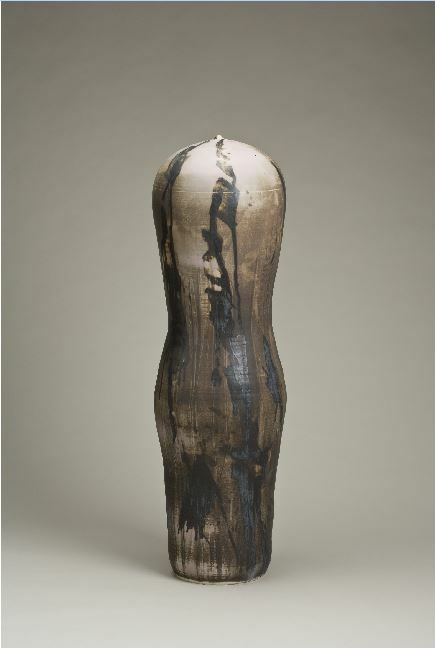 Toshiko Takaezu, Torso, 1990-1999. Cranbrook Art Museum. The final participant in this conversation is Toshiko Takaezu. Born in 1922 in Hawaii to Japanese parents, Takaezu came to Cranbrook in 1951 to study under Maija Grotell. Under the influence of Grotell, Takaezu took her mentor’s vision of outsized ceramic vessels and ran with it. The works on view in the vault are the realization of ceramics as sculpture. An exercise in organic abstraction, their volumes suggest living forms created through curved, meditative lines. Even their surfaces echo this reflective tone—though painterly and full of movement, Takaezu’s glazes feel contemplative and intentional. Yet despite the sculptural quality of Takaezu’s work, many of the ceramic bodies are still technically functional objects; with tiny pinprick holes at the top that only the thinnest blades of grass could fit through, these works fully embody the tensions between vessel and art that are gestured at in Grotell’s work. The sculptural quality of Takaezu’s work contrasts against Pewabic Pottery’s functionality, but both group of ceramics pay attention to glaze and surface. 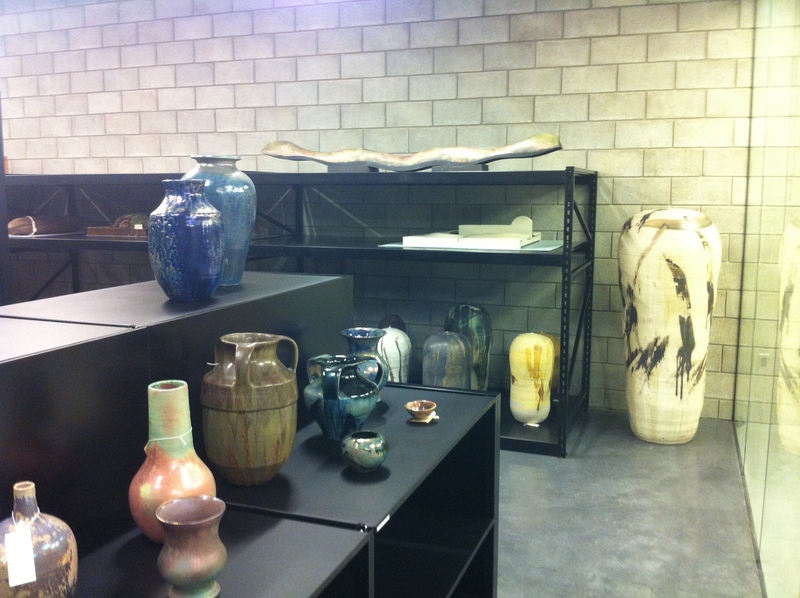 Ceramics vault, Collections Wing. Shoshana Resnikoff/Cranbrook Art Museum, 2013. This cross-generational object dialogue takes place not in the white-walled galleries of the museum but in the working space of collections storage. 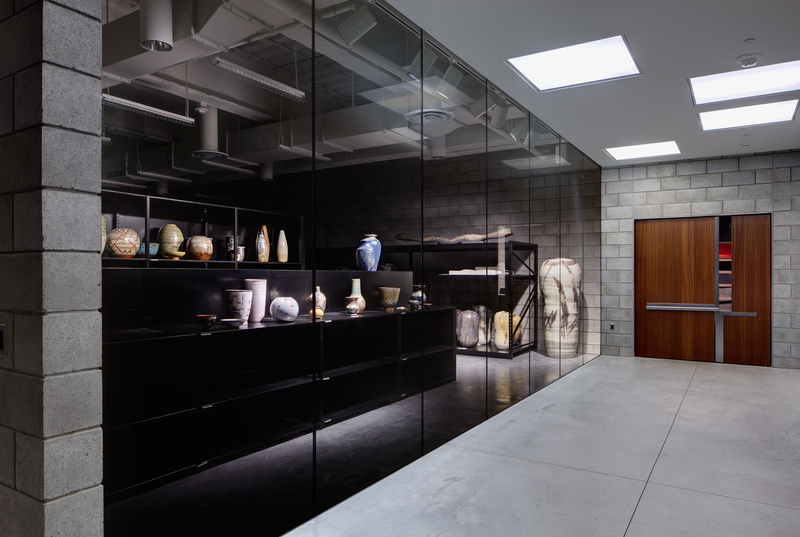 The mini gallery created by the glass wall of the ceramics vault allows for quick changes and small moments that would feel too informal in the museum but seem just right for visible storage. Moreover, spaces like these give visitors new reasons to tour the vault. Right now the “curated moment” of the vault tour is a conversation about form, function, and decoration between three legendary ceramicists with Michigan and Cranbrook connections. The Collection Wing tour season begins this November, and my colleagues and I are getting ready to change out the front shelves of the ceramics vault. Visit us in a month and you’ll get to experience a whole new ceramics moment, one that exposes you to undiscovered treasure troves in the collection and provides new insight into our holdings.